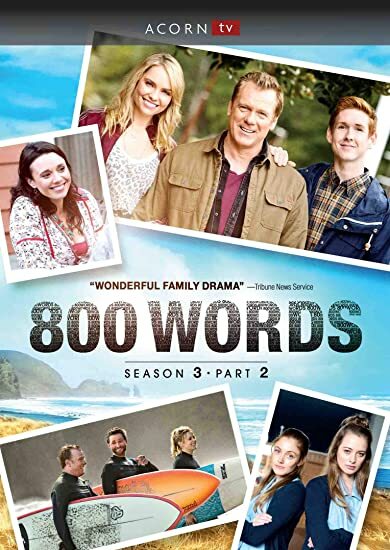 800 Words: Season 3, Part 2 - BUY THIS DVD! "Australian newspaper columnist George Turner (Erik Thomson, Packed to the Rafters) and his family have settled into their lives in New Zealand, but things are far from calm in their small coastal town. Following the wedding of his friend Woody (Rick Donald, A Place to Call Home), George begins dating someone new, providing endless fodder for the gossiping townsfolk. George’s teenagers face their own relationship issues as Shay (Melina Vidler) tries to get over her messy breakup, and Arlo (Benson Jack Anthony) becomes romantically involved with two girls at once. Later, the citizens of Weld fear that their town may be taken over by a neighboring community, and the Turners are rocked by revelations about the death of George’s wife a few years earlier. THEN SEND IN YOUR NAME AND ADDRESS TO contests@efilmcritic.com. Put "SO MANY WORDS!" in the subject line and cross your fingers. We will draw names and one of the DVD packages from Acorn Media could be yours. Only 1 entry per household.